The compassionate saint was excited by the prospect of doing good for the people. The story of Ramanuja being initiated into the Vaishnava Mantra after being turned down 17 times is well-known. Equally famous is the preceptor’s kindness to teach the sacred and ‘secret’ mantra to the common people, a gesture that earned him the title Emberumanar from Goshthipurna himself. It was to him that Mahapurna directed his disciple Ramanuja to go and receive the Vaishnava mantra with all its subtle meanings. But despite sincere and persistent efforts by Ramanuja, Goshthipurna refrained from initiating him into the secret mantra. Not once but eighteen times did Ramanuja knock at his doors. After the eighteenth attempt, Ramanuja broke down and shed tears of dejection. Goshthipurna relented and gave him the sacred eight-syllabled mantra with its mystic meaning but warned him not to divulge it to all and sundry. A breach of promise, he warned, would result in Ramanuja going to hell. Ramanuja was overjoyed. He acquiesced to the condition. However on the way back he was filled with compassion for the multitude of people who were caught in the rigmarole of worldly troubles. He was excited at the prospect of doing something good. He reached the Vishnu temple at Goshthipura, beckoned all the people he saw with these words: “Please come near the temple. 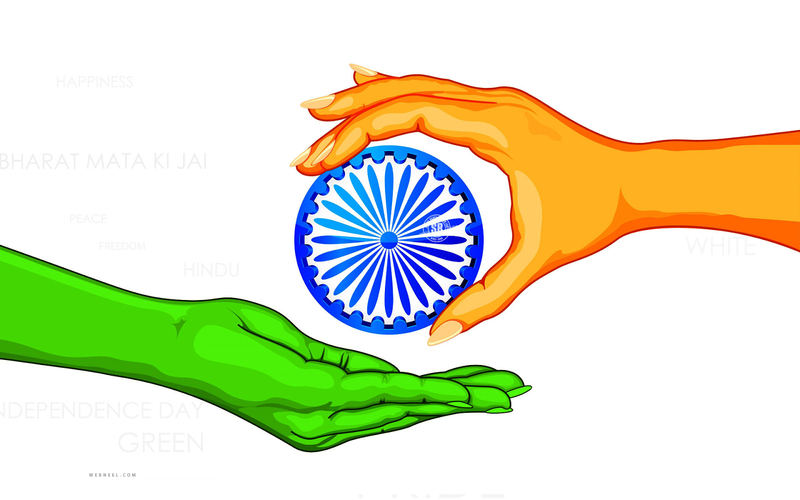 I will give you a priceless jewel.” Soon a vast sea of people converged. 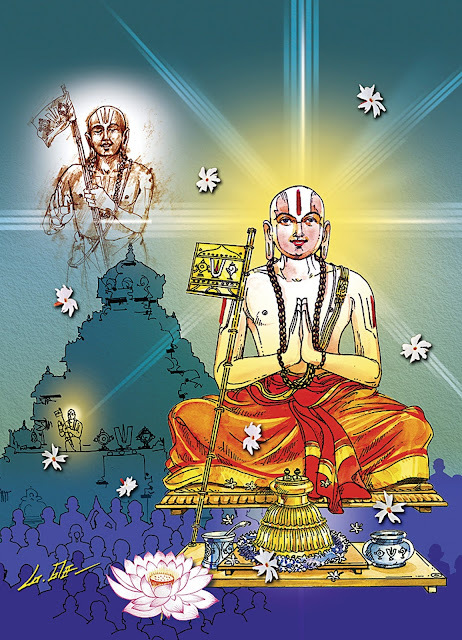 “Repeat, O people, thrice after me,” Ramanuja proclaimed loudly “the mantra that will free you from the tribulations of the world.” The whole area reverberated with the sound of the Narayana mantra. Goshthipurna was furious but Ramanuja was not perturbed. 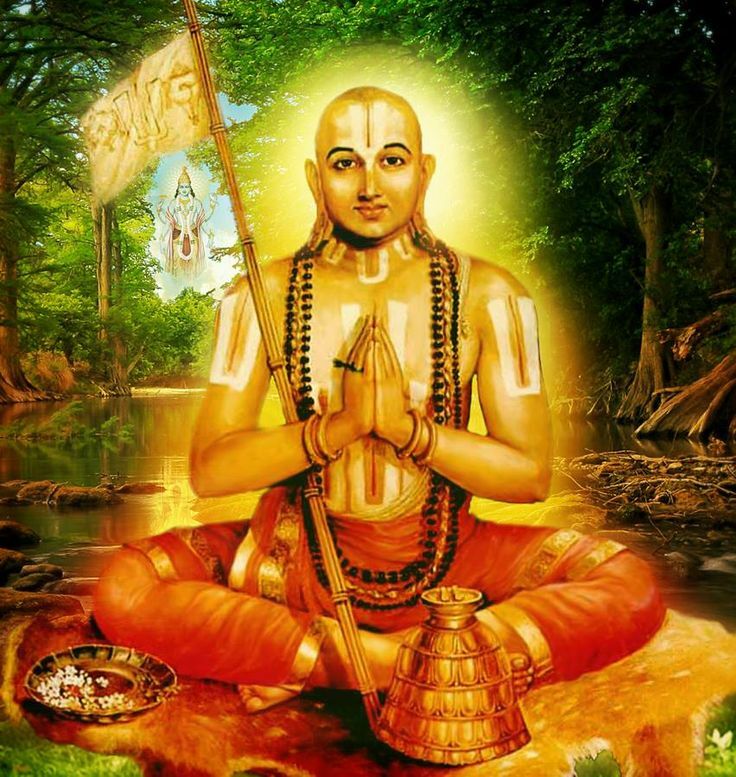 The compassionate saint that he was, Ramanuja decided that it was worthwhile for him to go to hell if he could secure the liberation of millions of people. Goshthipurna’s heart melted when he witnessed this person with a loving heart and not just a brain. It was his turn to seek forgiveness. With a voice choked with emotion he muttered “Pardon my offence. How can I grasp your greatness?” You are our great Lord! Emberumanar! Several incidents portray the humane quality of this genius. His intellectual attainments are reflected in his philosophical and literary works. While he mesmerised a good section of the populace, there were others who were intensely jealous of him as well. Plots on his life seemed to have been hatched right from his preceptor. Yadavaprakasa first, then a temple priest and finally even by a Chola king. But the divine grace was always with him and he survived unscathed. His kindly disposition and scholarship, drew to him several students. If he had five gurus, he had five star students too. Amongst them were the incomparable Koorathazhwan, who was prepared to lay down his life for his Yatiraja. Dasarathi who substituted for a cook at the behest of his guru, his erstwhile guru Yadavaprakasa and his cousin Govinda who had come back to the Vaishnava fold. In course of time, he fulfilled the promises that he gave to his guru. He wrote a commentary on the Brahmasutras after undertaking an adventurous trip to Kashmir to secure supportive texts called the Bodhayana vritti. He named the twin sons of Koorathazhwan as Parasara and Vyasa and fulfilled the final wish of his guru. Ramanuja travelled extensively with an entourage of 74 of his chief disciples and countless followers: Srirangam to Kanchipuram and from there to Kumbakonam, Madurai, Tirukurungudi, Tirukurugur, Tiruvanantapuram, Dwaraka, Mathura, Brindavan, Salagrama, Saketa, Badarikashrama, Naimisaranya, Pushkara and finally reached Saradapitha in Kashmir. Tradition relates that it was here that Goddess Sarada, pleased with his exposition, as a boy, of the phrase “kapyasam pundarikam eva akshini” conferred on him the title of Bhasyakara. From there, he proceeded to Puri, founded a monastery and called it Embar Math, after the name of his disciple Govinda. From thereon to Srisailam, Tirupati, Kanchipuram and finally back to Srirangam. His trip to Melkote was taken as a means of seeking refuge and did not form part of his travel during peaceful times. Ramanuja spent many years at Melkote. 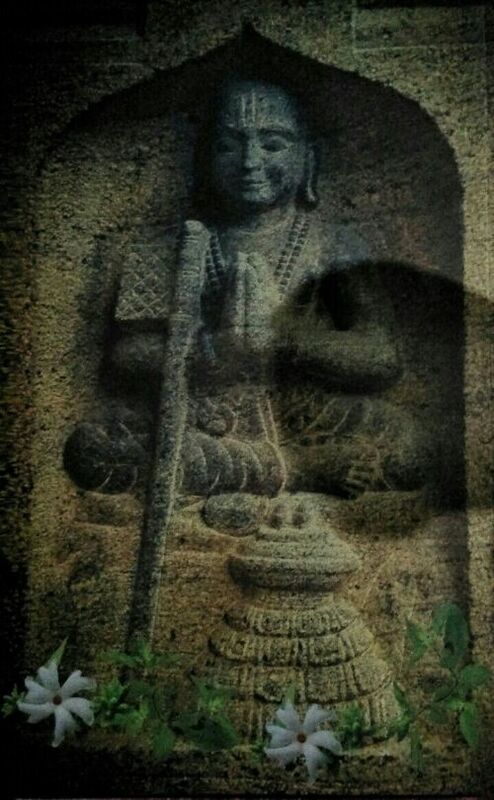 He became old and longed to get back to Srirangam. When they heard the news of Ramanuja’s impending departure to Srirangam, the natives of that place were sorely grieved. 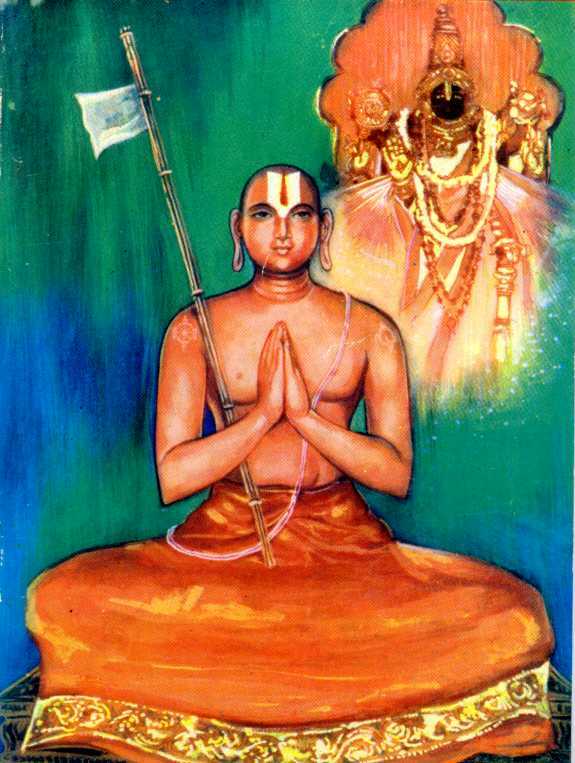 To appease their sentiments Ramanuja got an image of himself made and handed it over to his devotees with the words “When you desire to see me, you will get peace of mind by looking at this image.” Shortly after this episode, an image of him was installed at his birthplace, Sriperumbudur. At the time of the consecration of the image, Ramanuja was expounding the Sastras to his disciples at Srirangam. At one point he suddenly froze. A few drops of blood trickled down his eyes. When he regained consciousness he remarked: “They have now finished the rite of opening the eyes of the image” . Days passed. It was 1,137 AD and the time had come for him to shed his mortal coils. Ramanuja tried to dispel the gloom amongst his devotees. “Grieve not,” he said “over the disappearance of this perishable body.” To appease them further he had an image of himself installed. The Yatiraja transmitted his own powers to that idol by breathing into the crown of its head. At the moment of his final departure he lay with his head on the lap of Govinda and his feet on Andhrapurna (another disciple). He gazed at the padukas of his own Guru and peacefully entered the realm of Lord Vishnu. Excerpts from an article published in Nrisimhapriya dated May 2003. ஸ்ரீ ராமானுஜர் வழியில் தொண்டு செய்வோம்!